On Mar. 6, 2017, at approximately 12:01 p.m., the New Hampshire State Police responded to a crash involving a 2013 Toyota Highlander that traveled off the roadway and into the tree line on I89 South in Warner. The driver, Theodore Foot, 81, of Orleans, Massachusetts, and an adult passenger were transported to Concord Hospital for injuries that were not deemed life-threatening. Foot told investigating troopers he fell asleep behind the wheel, causing him to drive off the roadway and into the trees. 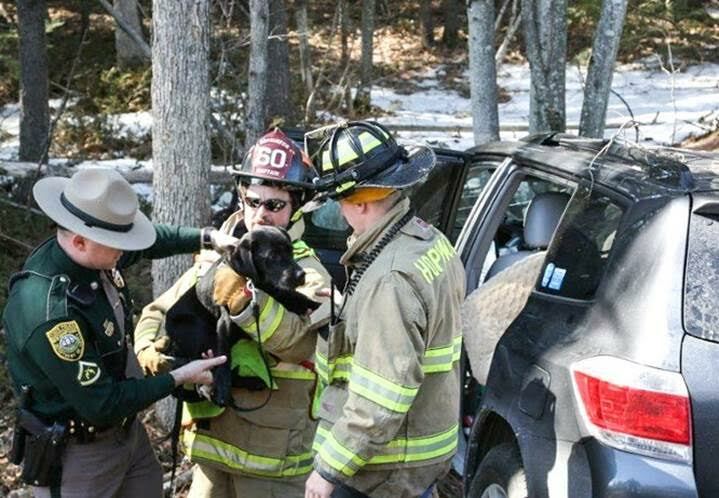 Two dogs in Foot’s car were cared for by troopers and members of Hopkinton Fire Dept. and then taken to the American Society for the Prevention and Cruelty to Animals facility on Silk Farm Rd. in Concord. Anyone with information related to this incident is encouraged to call TFC Daniel Baldassarre at (603) 271-3636.